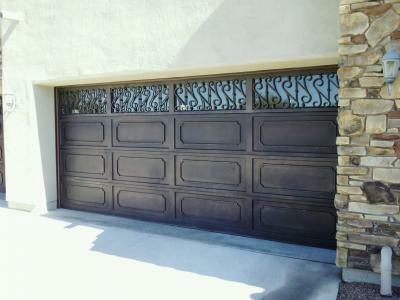 Signature Iron Doors is home to Phoenix Arizona. Now a global industry, but Phoenix is where it all started. Our largest showroom is just off Southern and 40th st. We have a thriving network with families and contractors across the valley from San Tan Valley to Cave Creek. No other company in the iron work market engineers iron entry doors, garage doors, gates, and railing at the price and quality Signature offers. Signature Iron Doors works to enhance homes across the world in both beauty and security. Each piece is hand forged by licensed welders along with a proficient design team. These are some pieces we built for Phoenix homeowners. The iron entry door and garage door are both in our Ashville design. Whatever size our style you want, Signature Iron Doors will provide it. All of our entry doors are built with 14” gauge steel and our garage doors are made with 16” gauge steel. All our products come complete with frames, lock, track, and hardware. They are finished with a zinc primer and epoxy paint. We firmly believe quality is in the detail. Our managers at Signature Iron Doors are involved in every part of the production process to insure not a single detail is overlooked. Call us and come visit our showroom in Phoenix Arizona to find out why Signature Iron Doors are the best in the nation and the perfect complement to your home.